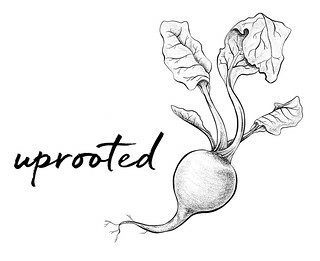 When I decided to participate in NaBloPoMo this past fall, I assumed that my biggest takeaway would be habit, that I’d come out at the end of those 30 days with the itch and ability to maintain a daily (or near daily) posting routine. This was an ambitious and probably unrealistic expectation, especially considering where I’m currently at in my life. Needless to say, it didn’t exactly happen. I did walk away from the experience, however, with something that I’ve found to be much more valuable. I learned that I need to trust myself. Since starting GF in the City way back when, I knew that writing a blog was something I enjoyed deeply and wanted to pursue. That said, I never found it to be particularly easy. 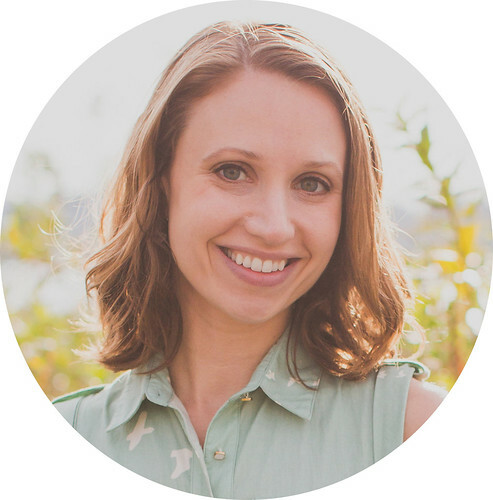 I’ve always felt discomfort at putting the things I create out there in a visible way—some fear of being seen or of being small and getting lost—and blogging was no exception. From day one, this terrible anxiety caused me to freeze up every time I went to publish a post. It was so intense at times that I would put off pressing the button on an otherwise totally finished piece for anywhere from a couple of hours to a couple of weeks. This sort of petrified, self-doubt-filled procrastination doesn’t fly when you’ve committed to publishing a post every single day for a month. So I had to get over it. I had to create something and then trust that it would be enough, which is ultimately the same leap I have to make when I sit on a post for two weeks anyway. Like checking the position of your mirrors before backing out in a car, I’d confirm that all the elements of the post were where they needed to be, take a breath, and hit publish. Today I’m exercising this newfound trust on a recipe that I’ve been both incredibly excited and terrified to share for almost a year now. I love, love, love this recipe. Chris loves this recipe. Roman loves this recipe. This is the recipe for our go-to vegan mac and cheese, or, as we’ve come to call it ‘round these parts: Veggie Mac. So, with five “love”s in the above paragraph, you may be wondering why the anxiety? Because there are a lot of vegan mac recipes out there, and many—maybe even most of them—claim to be the best vegan mac ever. Yikes. I’m not going to promise you that mine is finally and truly the best mac ever. I also won’t be so bold as to suggest that this would fool your omnivorous friends; it’s honestly been so long since I’ve had the real deal that, even if it were true, I couldn’t say it with any sort of confidence anyway. 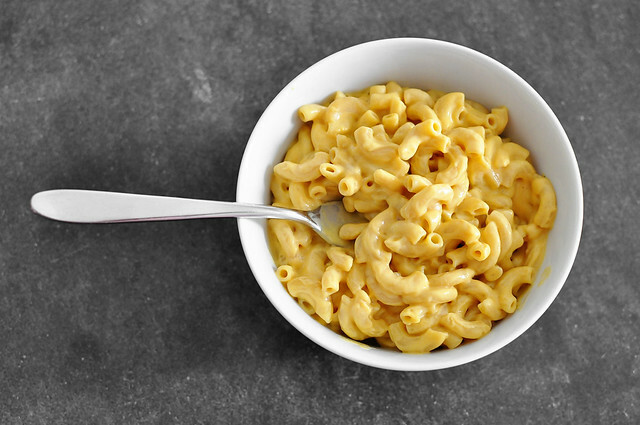 What I can say, truly and confidently, is that this mac is satisfyingly savory, crazy creamy, and just the right amount of tangy, nutty, and noochy. It also contains a decent dose of garlic, which is how I’ve always liked my mac, even back in the day. 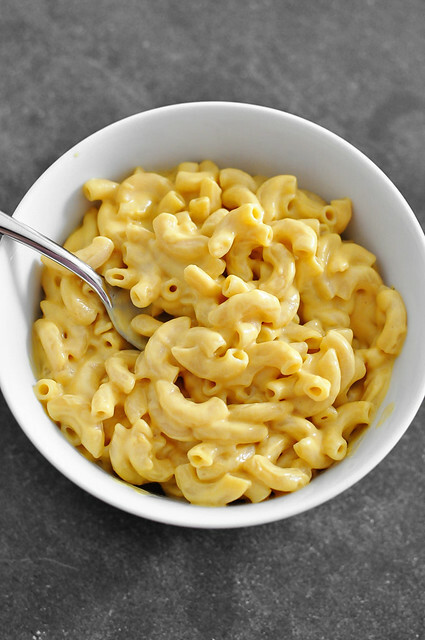 Another point in favor of this particular mac is that it doesn’t contain any oils or processed dairy substitutes. Inspired by this highly praised recipe, it starts off with a base of carrots, onions, and potatoes—thus the name Veggie Mac. From there, a combination of nuts, seeds, and seasonings elevates it to vegan mac and cheesy awesomeness. It’s an ingredient list that I feel darned good about and never hesitate for a moment to head back for a second bowl. That was my goal in creating this recipe. When I first tried the version from VegNews, I thought it was great, but couldn’t see using that much vegan margarine on any sort of regular basis and feeling good about it. I wanted a mac that I could make any time, that would be comforting and totally delicious but wouldn’t leave me feeling greasy and regretful afterward. This is that mac. 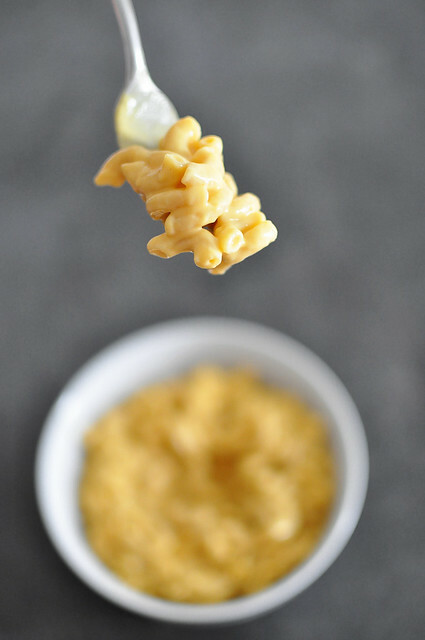 And now the time has come for me to trust that the recipe we love so much here in our home is ready to stand among the countless variations on vegan mac and cheese already out there. It may or may not be the best mac ever, but, seeing as how we happily clean our bowls every time it hits our table, I’d say it’s most definitely enough. This creamy, delicious mac and cheese just happens to made from whole plant foods. Since the sauce is built on a base of veggies, you can feel good about enjoying a big ol' bowl—or two. Veggie mac also plays well with a variety of mix-ins**. Place a large pot of water over high heat. 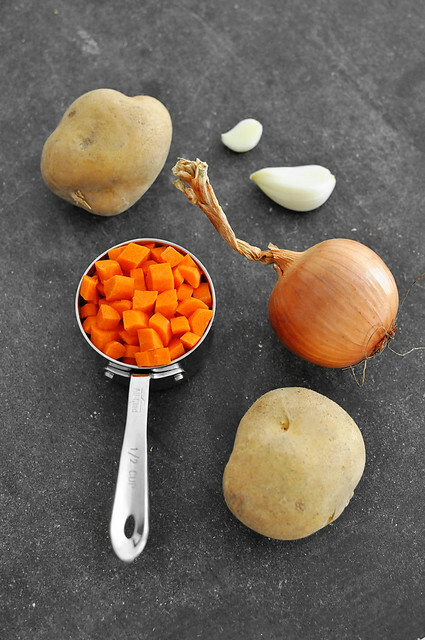 In a separate small saucepan, combine the onion, carrots, potatoes, and water. Bring to a boil, cover, and simmer on low for 15 minutes. 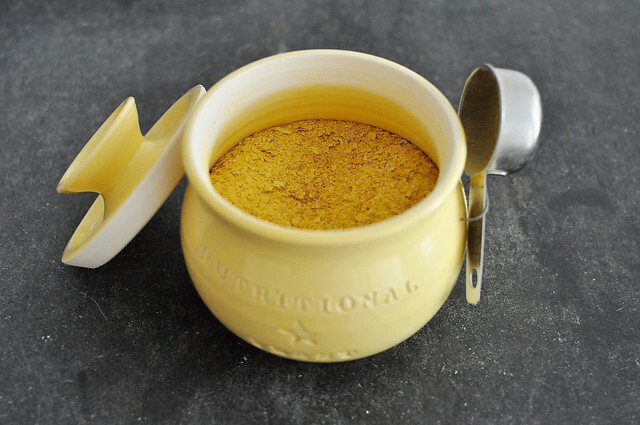 Place the remaining ingredients in the jar of a high-speed blender***. When the veggie mixture is finished cooking, add it (water included) as well. Blend on high until completely smooth. The sauce will be very thick, so have your tamper ready if using a Vitamix. Once the large pot of water has reached a full, rolling boil, throw in a fistful of salt and add the pasta, cooking until al dente. Drain the pasta and return it to the large pot. Pour in the sauce and stir to combine. *If you need this to be both gluten and soy-free, make sure to double check the ingredients on your GF pasta as some brands contain soy. **There is enough sauce here to generously coat 1 lb of dried pasta. If you want to add a moderate amount of mix-ins (wilted greens, a small head of broccoli), there is room for that. If you'd like to add a larger portion, I suggest cutting back the pasta to 12 oz to ensure enough sauce to go around. 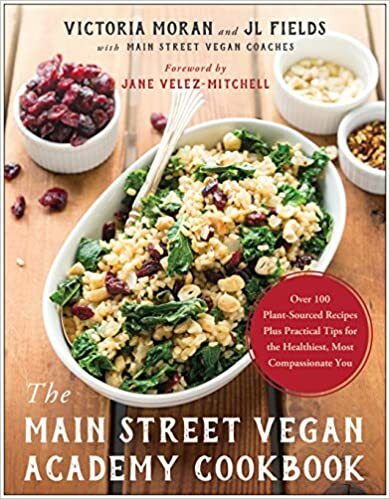 Some of my favorite additions to Veggie Mac include: roasted broccoli, spinach, and roasted tofu cubes. ***Because of how thick and viscous this sauce is, I would not recommend using a regular blender. I haven't yet tested this, but I imagine it may work in a food processor if you substitute ⅓ cup of raw cashew butter for the whole raw cashews listed in the recipe. I’ve been following your blog for a little while now. I don’t get to read everything, as life is busy. I’ve read a bit of ‘GF In The City’ and think you need not worry about any one or anything out there. Write your blog for you. Don’t worry about other people’s version of recipes. We are all different and I for one relish the idea of variations to a dish. I’ve only made one vegan Mac & cheese. It’s was delicious and my father wouldn’t believe that there wasn’t any cheese in it. So tonight I’m going to make yours. Your ingredients excite me because they are things that I have in the house all the time. That’s so important for me for when I’m in need of something without any shopping. I’m going to try and soak the cashews as I don’t have a vitamix. It’s only a year since I stopped eating cheese straight from the fridge, but have still been eating it in things. It’s a long slow process to get it out of my diet. Avril, thank you for this beautiful comment and for the very astute advice. So true and much appreciated! Well, I didn’t get to make your vegi mac when I wanted to as when I went to the fridge for the carrots they had gone mushy in places. They weren’t that old it’s just that sometimes I forget organic carrots don’t last like non organic . As things go, I forgot to make it. Then this morning I was thinking that my cashews needed using up and hey presto your recipe popped into my head.